One of the consistent battles I face as a researcher is the feeling of uselessness I experience in each and every interview I conduct. This is not to say that I believe our research is ‘useless’ – anything but. Research must continue to play an important role in revealing the realities and the complexities of poverty and social injustice. And by doing relevant and timely research we can continue to press for greater prioritisation of important development issues. One of these priorities simply must be youth unemployment. But sitting in Arusha while doing interviews with young people, I wish – and wish hard – that there is more that I can do directly to help. Life is tough for young people from low-income communities here. Coming from poor family backgrounds, even reaching and completing secondary education is difficult. Only 45% of school leavers get a lower secondary education, and only 3% make it to further education. On leaving school, young people – and young men in particular – face the dilemma of becoming financially responsible for themselves in an environment where employment opportunities are scarce and low paid. Nearly 60% of youth are neither in school nor employment. Those who can find work in factories, shops and small businesses, construction sites or as domestic workers are the ‘lucky’ ones, despite the meagre wages, hard work and often exploitative conditions these jobs entail. Despite these difficult circumstances, young people have defiant hopes and aspirations. They dream of becoming successful small business-men and women, of returning to college to get diplomas in information technology, hotel management or tourism that will lead them to better jobs, or of finding money to support apprenticeship fees, amongst others. But how can they reach those goals when there are so few pathways to progress? Even when employed, their salaries are not sufficient to look after their own costs and support their households, let alone to accumulate capital to pay for further education or invest in businesses. Jobs (for those that can get them) are insecure and often exploitative. Even where young people can start to save, savings often have to be diverted to react to emergencies or changing family situations. Parents or family members may become sick, requiring medical costs and family care. Early motherhood means priorities shift from investing in their own futures to investing in their childrens’. Dreams become a distant reality very quickly. From our interviews here, it is clear that it is not so getting involved in bad groups or criminal behaviours that hold people back from reaching their goals – as is so commonly perceived. This is a secondary outcome of a much more complex picture: a lack of opportunities that dampens aspirations, a lack of local role models to demonstrate what it possible with hard work and innovation, and a lack of support or guidance that could help a greater number of youth follow similar paths. So I was lucky, that through an interview with an inspiring young man, and through a strong partnership working with the Arusha branch of Shack/Slum Dwellers International (SDI – more on that later) and researchers from Tamasha Vijana, a participatory youth development organisation, we were able to co-design a project that will make a more direct and immediate impact on the lives of young people in the community. Our very first interview was with a young man who really got me thinking. Bakari Omary was an intelligent, secondary-educated young man with grand plans. He made his living as a piki piki(motorcycle taxi) driver, but was far from the ‘hooligan’ that people often associate with youth engaged in this profession. 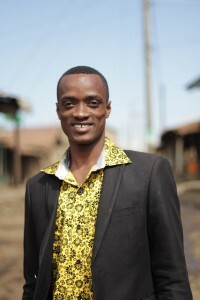 He wants to get an information technology degree, but spends large proportions of his income paying the daily rental fees (of 6,000 shillings, about £1.85) on his vehicle and gave most of his monthly income to his grandfather to help pay the household’s living costs and education fees for younger relatives. I left the interview inspired by him, but helpless and frustrated that there was so little support around that could assist young people’s own efforts to stay afloat and improve their futures. Here was someone that worked hard (6 days a week), was dedicated to improving his future and with plans to fulfil, and who seemed like a genuinely sensible and good young man. Although he saw piki piki driving as a short-term option that would fill the time before he made his way back to college or into a better job, there was little foreseeable opportunity for realising those goals unless there was a substantial change his situation. “I’m fighting hard to get what I need so that I can get enough to start a family when the time is right. I am not happy with my current work as a piki piki driver, because it’s not a destination or a dream. Hopefully this is just a passing stage that will get me somewhere else in the future. I’d like to study IT at university. I think I’ll achieve this in the future. If you desire something you have to work to achieve it. It doesn’t matter what age I am when I go back to school, I will do it when I can achieve it”. Whether and how he was going to be able to reach these goals was less clear. I left our discussion thinking deeply about how we can start supporting young people like Bakari to achieve these goals – both more effectively and at a greater scale. This is at the core of what my research seeks to answer and I hope that in the longer-term these findings will help stakeholders working with and for young people to design more effective interventions. But was there something more direct we could do in the meantime? For my research I have been working with the local Federation of Shack/Slum Dwellers International (SDI) in Arusha. SDI is an international network of urban poor communities, which with the support of local NGOs, mobilises community members through savings groups, building their collective capacity so that they can negotiate with local and national government and co-produce solutions for slum upgrading. Since the beginning of 2015 the Federation in Arusha have been trying to attract members to the recently initiated Youth Federation. They have found it difficult to get widespread interest, however, because with the exception of offering a safe place to save, they have been unable to offer tangible returns to membership. Since it is new, there have been no success stories to demonstrate to other youth that it is worthwhile taking part. Together we designed a revolving motorcycle project that could help Bakari and his savings group become owners of piki pikis. This (if successful!) will triple their take-home income and provide a much stronger foundation for them to plan and invest in their future goals. We based its design on two important premises. Firstly, that the savings group would do all of the hard savings work themselves, so that by the end of the project each would have bought their own motorcycle. Secondly, that the programme would be sustainable and its benefits would pass onto another group once the group were all owners themselves. To fulfil these, we decided to provide the group with one motorcycle to start the process. The first member to receive the motorcycle would save daily the 6,000 shillings he would otherwise pay in rent into a group savings account until there was enough to purchase a second bike. These two drivers would save until there was enough to buy a third motorcycle, and so on, until all six drivers own their own bikes. Once all six members have bikes, they will continue to save their rental payments until a seventh motorcycle is bought. This is passed onto another savings group for the process to start again. This design is similar to the Rotating Savings and Credit Associations (ROSCAS) that have been proven to work well for groups with similar goals and aspirations. What is unique to our model is the provision of a motorcycle upfront (rather than traditional designs which use member contributions to fund the first asset purchase). We believe that this is important for two reasons. Firstly is the fact that youth display very different preferences and behaviours. This mean that involving them in savings schemes is substantively different, as is reflected in difficulties motivating young people to join the Federation’s savings group. We are talking about a context in which many youth have ‘given up’: plans have been made and failed, and there is little chance for them to see any route to a better option. Providing the motorcycle upfront means that group members (and those around them) can see returns to participation straight away. Secondly, the design carries the additional benefit that purchasing the seventh bike at the end of the project means that the programme’s benefits become self-sustaining and, over time, reach a larger number of young people. It’s important to point out that although we outlined these broad parameters of the programme, the group themselves designed their exact rules and regulations. They decided that even members who hadn’t yet received a motorcycle would each save 2,000 shillings a day (about 60p), speeding up the savings process. They also set rules about what to do if people cannot pay in, about the ordering of who would get motorcycles, and about how members could borrow money from group savings to meet emergency costs (as well as how these would be paid back). Together they designed and committed to a strong group constitution and allocated different roles across the group. The local SDI Federation are managing the day-to-day operations of the programme. This brings the group and its members into the structures and support of the Federation. The benefits of this go beyond ensuring there is group accountability, making sure the programme works and enabling a smooth transition across subsequent cycles. It also brings Bakari and the group into the SDI fold, where developmental objectives are broad and achieved through regular meetings. Membership offers an important platform for participation in community activities and for building social support networks and competencies like leadership skills, self-esteem and confidence. It is easy to underestimate how crucial these things are to young people’s broader social and economic development. The research team fromTamasha Vijana play a strong mentoring role, meeting with them regularly not only for research updates, but also to see how things are running and to offer support and guidance where appropriate. The group received their first motorcycle in early June, in an event hosted by SDI that included the Ward Executive Officer and Chairmen from each of the six streets in the ward. All of these stakeholders praised the members for their commitment and offered their support as the programme progresses. Despite paying the equivalent of rental fees into the group savings account, the first driver, Rashid, has already enthusiastically reported back to us that he has increased his income substantially. He is now working longer hours and finding it easier to make relationships with a clean and good quality motorcycle. He now contributes 2,000 shillings each day to his household, has paid examination costs for his younger sister in primary school, and has bought his first mobile phone. Group members report feeling recognised and respected by the community and local leaders, and other young people have asked whether and how they can join such a group. However, it is not all good news. Bakari’s mother has become ill and he has travelled to Dar es Salaam with her for treatment, taking a break from contributing his daily savings while he is away and unable to work. The group will decide together after his return whether or not he will repay all of these savings. The University of Manchester will be working with SDI to monitor how the programme proceeds, making sure that we capture the successes and challenges that the young men face individually and as a group. We will be tracking individual and group progress in setting and meeting goals, and how group strategies change to cope with challenges that they will undoubtedly meet. We are also using financial diaries to track members’ financial behaviours and how these change throughout the project. It will be critical to capture all these lessons so we can better understand what works – and what doesn’t work – in the model. We expect that it will take 1.5 years for the group to buy all seven bikes, although this may vary depending on how group strategies or individual circumstances change. Understanding these changes – and how the group responds – will be central to the research, which will continue beyond the end of the first cycle to see how the group proceeds after their commitment ends and to monitor how the transition to the second group proceeds. We will be posting regular updates to the blog and through my twitter feed (@Nicolabanksnm) for up-to-date insights into how the group are getting on. We’d love to hear from anyone who may be involved in similar projects and may have lessons to share. Please do get in touch! This post was written by Nicola Banks and first appeared on Development@Manchester. Nicola’s research, Youth, Poverty and Inequality in Urban Tanzania is funded by the ESRC under the Future Research Leaders programme. The University of Manchester’s Faculty of Humanities has funded the on-going research into this project, which was started by a private donation from Nicola and David Hulme.